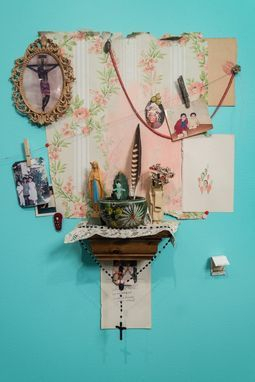 Within my body of work, I explore the broad language of Latinx identity through portraiture, religious imagery, dialect, altars and various mix media. I digitize and document photographs of families, then the images are reproduced and altered. Anonymity is given to these figures as they become shrouded/masked using materials such as glitter, tinsel, sequin, thread, wallpaper, flowers, and Cheetos® Flamin’ Hots. The eyes become the only feature visible, leaving the viewer to connect solely through the gaze of the figure. Caló slang and Catholic iconography help further comment on narratives pertaining to the Latinx community such as deportation, gangs, incarceration, ritual and immigration.